The WattNode provides accurate measurement at low cost to meet your needs for sub-metering, net-metering, energy management, and performance contracting applications. This WattNode Delta or Wye-connection kWh Transducer works with Magnelab AC Current Transformers and a Pulse Input Adapter to provide True RMS kilowatt hours of energy used, even for loads with non-sinusoidal waveforms. Because these sensors tie directly into the line, they should be used only by qualified personnel. This model supports a 3-phase Delta-connection of 480 VAC. • Measures 1, 2, or 3 phases in 2, 3, or 4 wire configurations. 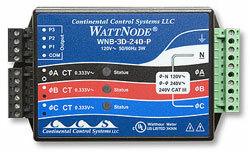 • Use with wide choice of CTs (sold separately),ratings from 5 to 1500 amps. • Accurate measurement of 1-,2-, or 3-phase configurations. • Easy to install and wire. • Pulse output - Compatible with pulse input logger models. • Small size - Can be installed in existing service panels or junction boxes. • Diagnostic LEDs – Confirms proper installation for all phases. • Bidirectional metering – Net metering for PV (photovoltaic) solar and wind power generation with only one meter. • Metering of variable frequency drives. • Line powered - No external supply required. • Detachable terminal blocks - Easy to install and remove. • UL, cUL Listed - Designed and tested for safety and use throughout North America. • CE Mark – Can be installed throughout the EU. 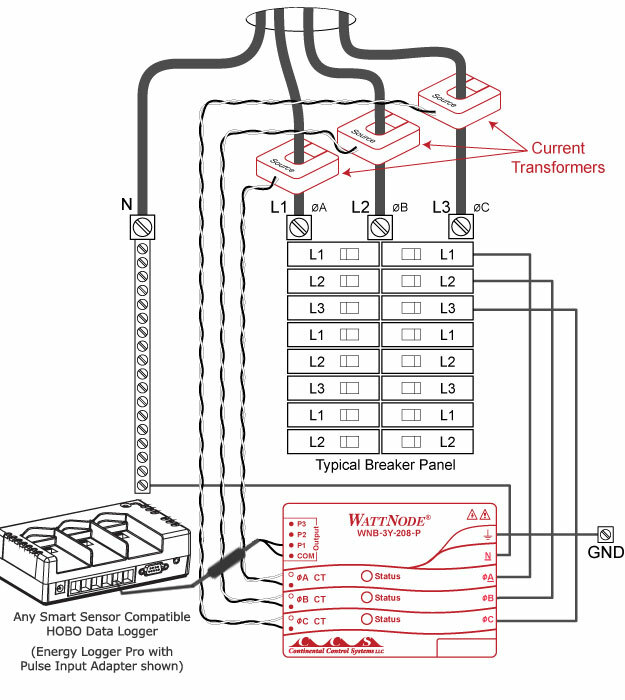 To download the manual from Continental Control Systems LLC click here.